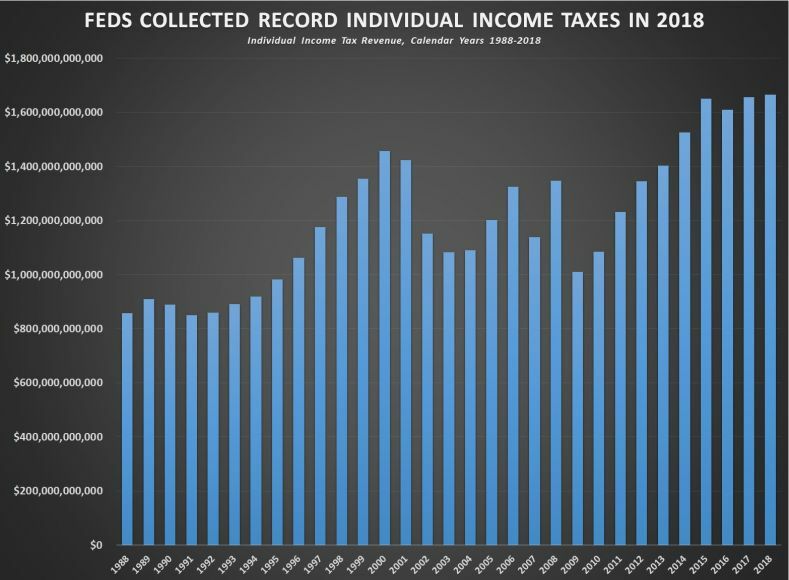 As I reported before, the US collected record income tax revenues after the tax cut. This is due to higher real wages as well as more people working. So lower tax = higher receipts for the federal government. This is a strong indication of what I’ve written here for a decade now, we are on the back side of the Laffer curve and the government was taking so much it was creating a bad economy. I reported this in my previous post – refuted indirectly by the NYT despite showing no data. I’ve found several sources since then which agreed with me. Today I found one that was apparently inflation corrected and still MORE INCOME TAX REVENUE!! The bad news is that the government spent it all and more!!! — A LOT MORE. Link to this source is here. This entry was posted on February 14, 2019 at 10:20 am	and is filed under Uncategorized. You can follow any responses to this entry through the RSS 2.0 feed. You can leave a response, or trackback from your own site. Personal taxes did increase slightly, but corporate taxes fell by more than 30%, so the national debt grew by ~$1.4 trillion. And Federal expenditures (of course) continued to grow. This is not sustainable. Narrowing the Federal deficit is never popular (you have to either raise taxes or cut entitlements…. or both… and everyone screams. Do you not consider the rapidly growing national debt a serious problem? If so, what would you propose to address this growing problem? To be clear. Personal tax rates did not increase, they were lowered significantly. Revenue from personal taxes was increased due to increases in wages and more importantly the size of he labor force. I think we likely agree on that. Overall revenue also increased btw. But so did spending- massively so. I want to slash the spending dramaticallly but if you want more revenue a 10% reduction in corporate tax percentage from here may generate it in a few years. You say either raise taxes or cut entitlements. The tax portion of he standard thinking is reversed. Higher tax is NOT more revenue. Let us compete with the rest of he world on a fair playing field and watch what happens. I work in Flint, Mi and it is amazing to see how many people are upset with the corporate tax cut while more of their family members are finding jobs, many for the first time. I’m interested if Jeff could comment on if the reduction in regulations has had any impact on business operations for his company. I’m on my iPhone so I can’t thumb a book back to frank and may have an inadvertently corrected word. We have seen zero, literally zero deregulation. In fact, in our world the regulation continues onward. I really want to tell a better story because other industries have benefitted but not us. I can say that not far from you, we are having big difficulties hiring. So many first time employees. Jeff: IMO, the Laffer curve was completely discredited in the decade following the Reagan tax cuts, when individual income tax rates were increased three times before the resulting budget deficit finally was brought under control. One year is too short a period of time to judge the 2017 tax cuts. However, here is some data. That 0.76% drop in total Federal revenue DISCREDITS the Laffer Curve. We had individual tax cuts of approximately 1% of GDP and corporate tax cuts of 0.53% of GDP, and we lost 0.76% of GDP in total revenue. … in a great year for the economy. Yes, the stimulus of taxes cuts prevented the full fall in revenue one might expect, but it certainly didn’t pay IN FULL for the tax cuts. You only cited the negligible rise in revenue from individual income taxes rise in 2018. Why was there no loss here???? The cuts in individual income tax rates apparently amounted to 1% of GDP. At least, the CBO says expiration of these individual tax cuts will add 1% of GDP. Employment rose by 2.4 million in 2017 and 2.2 million in 2018. It is hard say the tax cuts increased employment. Wage and salary growth was 4.7% and 4.4% in 2017 and 2018. That was about 2.5% and 1.2% more that GDP rose. Low unemployment is partially responsible for this. Unemployment was 4.6%, 4.1% and 4.0% in January of 2017, 2018 and 2019. About 1/3 of GDP goes to wages and salaries, so we need to divide wage growth by a factor of three to get the increase in wages as a % of GDP. That gives us an 0.4% of GDP increase in wages. Revenue from individual income taxes declined 0.1% of GDP between despite the large increase in wage and salary growth in 2017. In fact, it has dropped a total of 0.2% of GDP since 2015. My guess is that the variability in revenue from individual income taxes is mostly due to changes in capital gains and dividends earned by the investor class. After all, the top 1% pay nearly 50% of individual income taxes. The expected 1% of GDP decrease in individual income tax rates could easily have been compensated for by a 2% increase in capital gains, dividends and other investment income. 2018 was a great year for the market for much of the year. My mutual funds are paying out a lot of revenue despite the fact that the market fell sharply in the fourth quarter and broke even for the year. Those losses haven’t been realized, earlier gains have been. There have been lots of complaints about how little of the corporate tax cut was re-invested, so a lot presumably was passed on to investors in one form or another. This isn’t going to help investment to produce GDP growth. In 2015, another good year for the investors, individual and total revenue as a % of GDP were even higher than 2017 and 2018: 8.52% (+0.28% and +0.20%) and 17.96% (+0.75% and +0.51%). The lack of a drop in individual tax revenue in 2018 is almost certainly mostly due to investors doing well, even though individual workers also did better. The CBO expects total government revenue as a % of GDP to remain between 16.5% and 17.1% of GDP (below the 17.21% to 17.95% realized from 2014 to 2017) until the individual income tax cuts expire in 2024. Assuming they do expire. So the prospects for a smaller budget deficit depend solely on GDP growth, and holding spending increases to less than GDP growth. Entitlements and interest are expected to rise by 3% of GDP over the next decade and discretionary spending is only 2.5% of GDP, so spending is likely to rise as a % of GDP. The CBO projects deficits will remain constant if GDP growth AVERAGES 4.4% of GDP. That will never happen. Estimates for GDP for the next two years are around 2%. At some point, we will inevitably need to do what we did after the Reagan tax cuts – raise taxes. Some will blame out of control spending. Some will claim the stimulus from tax cuts didn’t pay for the tax cut as Laffer claimed. Discovering the truth among the cherry picking will be difficult, especially given confirmation bias. Tax revenue as a % of GDP is not the intent of the Laffer curve, tax revenue as total dollars received is. Seeing total GDP get back to healthy growth levels is the point. If you ever want to beat our current debt, we need to increase productivity and the tax cuts did that to such an extreme level that we have outpaced the reduced revenue as a % of GDP in the very first year. Even I didn’t predict that. “My guess is that the variability in revenue from individual income taxes is mostly due to changes in capital gains and dividends earned by the investor class.” – I believe it is due mostly to increased employment. Try to hire an engineer these days. Expensive and rare!! Investor cash is part of the deal of course, they invest and more people make income at higher levels. So income tax receipts rise despite taking a lower percentage. Spending MUST be slashed. Especially on welfare programs because we need our people to work if we want to achieve higher productivity and we have incentivized large numbers of people to take government money and vote stupid in exchange for it. One such class are single young women who literally don’t need jobs anymore, they simply need to remain unmarried, have babies preferably with multiple low income men and work the system. It is a very sad situation which I see in our employees too often and it is caused by our welfare system being over-generous. Expressing revenue as a % of GDP makes it sound as if the government is entitled to a certain percentage of what this country produces. I don’t like that perspective, but those are the units the CBO uses in its reports. However, if you use the numbers in the article YOU linked, individual income tax revenue rose 0.6% in real $ and total federal revenue fell by 2.3%. The failure of the 2017 tax cuts to pay for themselves in terms of total federal revenue in real dollars also discredits the Laffer Curve. Which is good, since the increasingly socialistic Democrats have recently adopted an equally absurd theory (Modern Monetary Theory) which claims that deficits don’t matter: Deficits can be financed by expanding the Federal Reserve’s Balance Sheet, in other words by more Quantitative Easing. The 0.6% rise in income from the individual income tax is almost certainly due to the rise in individual capital gains and dividends. If you look at your link, 2015 was nearly as good a year for collecting individual income taxes as 2017, while 2016 was much weaker. Employment rose steadily over the past few years, but the stock market did poorly in 2016. From 1995-2009, capital gains taxes averaged 9% of individual federal income tax revenue, but ranged from 6% to 12%. The increase in revenue from capital gains certainly could account for the rise income from individual income taxes. The failure of the 2017 tax cuts to pay for themselves in terms of total federal revenue in real dollars also discredits the Laffer Curve. That’s unusually sloppy for you Frank. We didn’t see any tax reductions until 2018 so I suppose that refutes your statement? I suppose though that non-business owners didn’t recognize the impact as keenly as myself. As I also said, I didn’t expect such an instantaneous payback from the cuts but in 2018, they absolutely achieved a higher overall income tax revenue by cutting income tax which to me was a shockingly fast result. Seriously, it’s like you want to be right about the Laffer curve so the arguments are all over the place. It doesn’t matter whether you prefer a % GDP or not, that is NOTHING to do with the Laffer curve which attempts to identify revenue maximization as a function of taxation and in fact is one of the lessons the concept intends to teach. The argument you made is a little embarrassing but really disagreeing with the Laffer concept is a bit like disagreeing that CO2 traps heat. It does exist in both cases, it just becomes a discussion of magnitudes at that point. The very idea that the Laffer curve is ‘disproven’ is ludicrous in the extreme. Once you recognize that at either zero or 100 percent taxation, you get zero dollars, you can argue it’s value and shape and nothing more. I have often argued that we are on the back side (downslope where higher taxation will give lower revenue) of the Laffer curve and the new tax law has clearly demonstrated that fact! Discretionary spending has been slashed: by 50% as a % of GDP – IIRC. The savings have mostly gone to Social Security, Medicare and Medicaid, not welfare. No party is willing to tackle the entitlement problem. Welfare was significantly reformed in 1995, but there are many loopholes and exceptions to the rules that welfare benefits are supposed to be temporary. For example, food stamps are temporary benefits everywhere except areas where unemployment is much higher than the national average. This rule doesn’t change because national average unemployment is now 4%. The Great Recession and growing income inequality made it easier for Obama to relax the rules. Well, we did reduce our debt in the late 1990s by collecting about 20% of GDP in federal revenue. When Bush II came into office, Treasury didn’t need to issue much new debt to pay off maturing debt. You can correct this data for annual changes in the labor force participation rate: 0%, +0.4%, 0.3%, 0%, -0.2% and -0.2% in the 1960s, 1970s, 1980s, 1990’s, 2000’s and 2010s. The prime labor force participation rate (ages 25-54) tells us that our aging population accounts for about half of the drop since 2000. Since the 1960’s (which were stimulated by the Kennedy tax cuts), the best decade was the 1990’s with a 2.0% increase in real GDP per capita with a stable fraction of the people working. The 1970s and 1980s were only slightly worse (1.7% and 1.8%) in terms of real GDP increase per worker (ie productivity). Over most of this period, the education level (and therefore potential productivity) of American workers increased sharply. The review below says that rising eduction added about 0.4% to the increase in productivity. Worker education in traditional schools has reached a plateau and is unlikely to contribute to rising productivity. So the 2.0% growth in GDP/worker (productivity) might be 1.6% in the future. Working age population is expected to rise 0.14% per year over the next decade without immigration and 0.5% with immigration. With immigration, the increase in workers could get us back to 2.1% real GDP growth. Or, to put it more simply, the 1990’s 3.2% real increase in GDP – possibly a best-case scenario – becomes 2.1% with 0.7% slower growth in workers and no improvement in education (-0.4%). This may be why most economists are projecting GDP growth of about 2% or less in 2019 and 2020, even in the absence of a recession. *The effect of capital investment on productivity is missing from the above analysis. The article I relied upon said that capital investment as a % of GDP has been fairly constant over the last five decades. So a 2% increase in productivity is a result of that fairly constant capital investment. Some of the weaker decades might represent less capital investment. So, if you think healthy real GDP growth should be 3% or 4% per year, then the 2017 tax cut needs to simulate a 50% or 100% increase in capital investment as a percentage of GDP. There are many other analysis of “Total Factor Productivity”, most of which are too complicated for me to read and fully understand. Some use different “deflators” to convert nominal growth to real growth, so even the basics look different. But they all must account for the fact that future growth in education appears negligible and growth in the number of workers will be much slower than in the past. Waving a Laffer magic wand worked when the top marginal rate was 90% and a 20% cut in marginal rate tripled after-tax investment return. A 20% tax cut from a 50% top marginal rate only produces a 40% increase in investment return. For the past quarter century, interest rates have been low and a glut of savings spawned two asset bubbles. There was plenty of money for big companies, venture capitalists and hedge funds to invest in productivity without the 2017 corporate tax cut. (Small companies may be different.) Stagnant demand has been a bigger problem, especially since most of the economic gains went to the top 1% or 10%, who spend a smaller fraction of their income than everyone else. The reality is that we taxed manufacturing right out of America. In the past we did well with service businesses and tech companies (i call them fake tech because they don’t do anything) and ‘virtual’ productivity went up despite producing little of actual value or developing any real technology. My points stand that the reduction in taxation has resulted in a large increase in manufacturing investment and revenues fully offset the reduction in percent income tax in the FIRST year! Huge, ‘face palm’ type proof of the Laffer curve’s value and no equivocation using past events can take it away. My net tax rate was at about 80% simply because we are a successful company. Growth of items like inventory or equipment are all considered assets to be depreciated over time and created a much higher effective tax rate. You have to pay the Feds a lot of money for the privilege of investing. As a service company, things like google don’t have to increase investment in large equipment like a manufacturing company. For non-public companies, cash is hard to come by and the asset depreciation law for fast growing firms results in massive effective taxation. Like a boot on our necks, this was a huge impediment to our ability to have new manufacturing in the US. Startups couldn’t make it in manufacturing while startups like law firms, fake tech companies, banks, and insurance organizations could thrive while producing little of economic value. From these tax changes for manufacturing, the employment boom has already made it nearly impossible to find people. In addition to our own investment, I know of two large-scale manufacturing businesses I’ve talked with have made massively increased investment in capital equipment specifically in the US. I can think of one company which hasn’t mentioned it directly but I haven’t asked them yet. We can talk ourselves in circles about history and what caused what but the left has poisoned those thought processes quite thoroughly in both economics classes and news so it doesn’t interest me much. What I’m saying is that tax law is more complex than a simple percentage, so the net taxation (cost of government support for different types of businesses) is truly unknown to those not immersed in it. I find bloggers often miss that aspect of the conversation. As automation increases in manufacturing to offset labor shortages and improve efficiency, I expect we will now see rises in manufacturing ‘productivity’ in the US although I don’t know where to find that data at this moment. The argument that we cannot break some arbitrary glass ceiling of growth strikes me as one similar to the peak oil argument. We really don’t know what the limit of productivity actually is but that doesn’t stop people from claiming they do. The “Laffer Curve” is a well researched and proven concept. The exact shape of the curve though varies from time to time and is not fixed. To portray it as a simple linear relationship is almost certainly incorrect though it is probably not wildly different. The one tax reform I would certainly recommend to the USA is to impute corporate taxes and tax dividends at personal income rates. Thus a company pays a nominal dividend consisting of a cash portion and a tax imputation portion which is proportional to the tax the company actually paid. The shareholder takes the gross dividend as income and has the imputation available as a tax credit. So all income is taxed at the same rates whether “earned” or “unearned”. The best part of this is that a company that actively avoids tax by various schemes cannot pass much if any tax imputation benefit onto its shareholders, so any dividends from such a company are taxed more highly in the individuals hands. Whereas a company that pays the full rate passes on a substantial credit. Income is taxed only once, and on a single scale, in the hands of those who benefit – the individual. The current system actually actively encourages tax avoidance as all dividends regardless of the tax paid incurs the same low rate. Imputing taxes and paying at the personal rate negates much of the tax avoidance industry – so it may not be popular in certain areas, but it is effective and avoids a lot of distortions. Based on recognizing the true tax incidence in that ultimately only individuals can benefit from and pay taxes. Please note that I will not respond to comments from those who have not watched these two videos in full (15+8 minutes) and asked genuine questions about the content. Jeff: I find your personal experience as a small business owner valuable and I agree with much of what you wrote about in your last reply. IMO, investments in growth and productivity by publicly-owned corporations are dominated by the expectations of mutual fund and hedge fund managers (aka “share-renters”, not shareholders) and their time horizon isn’t very long. If the tax cuts are going to dramatically stimulate investment, we’ll probably need to rely on small business owners like you. One year is probably too short a period, so the longer term projections from a variety of groups might be of interest. Of course, Brookings may be a biased source, so I checked AEI.